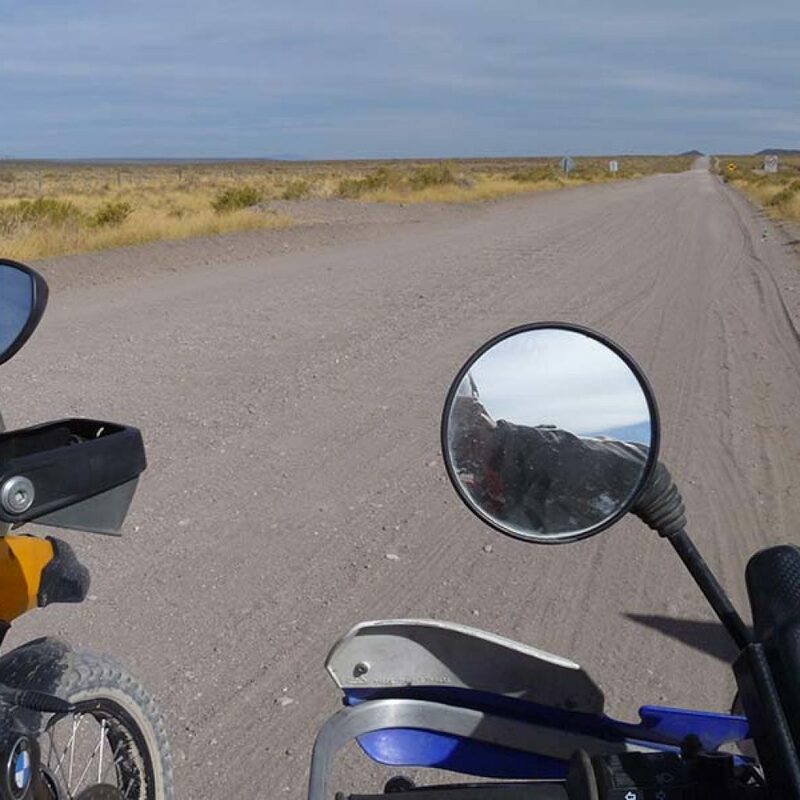 Claim "Ruta 40 – Argentina’s National Route 40"
A motorcycle tour of Ruta 40 is a journey of mythical proportions in terms of its distance, unforgiving wilderness and kaleidoscopic spectrum of Argentinian culture. From the southernmost tip of Patagonia to the Bolivian border 5,000 km north, La Cuarenta (The Forty) as the locals call it, is one of the longest routes in the world with sections that qualify as some of the least travelled on earth. You’ll traverse 11 provinces each with their own unique identity and intriguing historical sites; encounter 20 national parks and 24 major rivers and rise to over 5,000 metres at Abra de Acay, the highest point on a national road anywhere in the world. Around the southern Swiss-tinged resort town of Bariloche and the rolling wine country of Mendoza things are relatively busy but the majority of Ruta 40 is a wild frontier, cleaving Argentina’s vast open terrain, flanked by the towering Andean peaks. The rugged nature of Ruta 40, especially in the south, is the very thing that draws intrepid travellers but it’s a humbling and unforgiving route. You’ll encounter compact dirt, loose, gravel, sand, river crossings, hairpin bends and vast open straights buffeted by harsh cross winds. This is for those who have at an off-road tour of two under their belt. With a UK, US or Australian passport you will be granted a 90-day stay in Argentina. Your passport should be valid for at least the duration of your stay and it’s best to have proof of onward travel before leaving your home country. Note: at the time of writing, Australian tourists must pay a “reciprocity fee” of USD100 to Argentine Migration (www.migraciones.gov.ar). The Big Question: South to North, or North to South? If you’re coming from the infamous Death Road or another Bolivian tour then north to south is the go. The southbound journey begins in La Quiaca, Argentina’s border with Bolivia, and takes you through beautiful Salta city and the highest altitudes of the whole route, followed by the Cafayate region, home to awe-inspiring rock formations and stunning country. Overall, the north is more forgiving riding, so by taking this route you’ll gradually wind up to the ego-slamming southern stretches. The classic south-to-north throws you in at the deep end in terms of terrain but gives you the chance to ease your way up to the high altitude sections. If you take this direction it’s a great idea to cruise down the coast from Buenos Aires to begin. Alternatively, fly into Ushuaia (the southernmost city in the world) and head north from the very bottom. The gigantic granite towers of Mount Fitz Roy in the far south are one of Argentina’s most spectacular sights. If you’ve come from the north, after days on the flat with only your meandering thoughts and wheeling condors for company, the sight of the rock formations rising out of the barren steppe is like a mirage. A mysterious sight in stark contrast to the endless emptiness of Patagonia is the Cueva de las Manos, situated near the towns of Los Antiguos and Perito Moreno in the Río Pininturas canyon. The eerie, fascinating caves contain thousands of human handprints dating back over 8,000 years. To reach the site you will have likely travelled long hours without seeing a soul, which makes the ancient human presence even more intriguing. 250-300 km north of the caves in the Sarmiento region is a petrified forest, turned to stone 140 million years ago. The Mendoza region at roughly the halfway mark is home to Argentina’s bold Malbec wines. The ripe landscape sits in the Andean foothills and is an idyllic place to rest and relax. Many of the most awe-inspiring vistas along Ruta 40 are inaccessible by car, such as the Laguna Diamante, a barely accessible lagoon flanked by the silhouette of Maipo volcano. Ruta 40’s highest stretch in the northwest is incredibly scenic with its rolling hills and crumbling stone houses. At Belen in Catamarca where the locals have kept traditional weaving alive you should invest in a classic poncho for the authentic wayward spirit look. What’s more, they’re very practical! On a southbound tour, when you finally reach Rio Gallegos you should head over the Strait of Magellan into Tierra del Fuego and onto Ushuaia, a highly noteworthy leg in itself. When you reach the end of the world, make an about turn and head back up the coast to Buenos Aires. On a northbound tour, the adventure needn’t stop! When you reach the border at La Quiaca, blast over into Bolivia with its otherworldly terrain and legendary Death Road. Fill up at every station. There a hundreds of kilometres between service stations and even if a town has one, you always run the risk that it is out of petrol. Some travellers have reported queuing for hours only to be told that a new tanker is arriving later and that even after it arrived, they had to wait until dusk before they could get going. Note: carry a spare rally/knobby rear for the southern dirt roads. If you’d prefer to go the distance on a single set, get a solid dual sport variety. In a nutshell, make reservations in the below towns that offer welcome comfort and amenities but prep like you’re on 5,000 km camping trip. The type of lodgings you’ll find on rural stretches are called estancias. They’re cattle ranches and while they’re not designed for comfort, they do add something to your huge sense of accomplishment! You’ll need to book in advance. For information try: www.estanciasdesantacruz.com. There are companies that organise tours with estancias stays. If you’re travelling independently it’s still worth contacting them for advice: www.guiatierrabuena.com.ar and www.lastfrontiers.com. Midway up, or down, you should be able to find good quality accommodation at the popular resort town of Bariloche. Further south there are pleasant rooms to be had in the charming towns of Los Antiguos town and Perito Moreno, close to the Chilean border. El Calafate is a melting pot of travellers and it’s worth booking ahead here. For someone on an epic 5,000 km motorcycle-tour-meets-camping-trip, rations are vital. While you can and should stock up on fine Argentinian reds at Mendoza, don’t expect to drink them on a cosy porch of a rustic cabin with a hot steak off the fire after a long day in the saddle. There are some places where this romantic ideal exists but the reality is you’ll regularly be making camp outlaw style! Water bottles are as vital as spare fuel cans. Always fill up when you have the chance. It would appear that many ATMs do not like foreign cards. Additionally, many hotels, supermarkets and even restaurants do not accept foreign cards due to the chip and pin system. Either take bulk currency with you from home or withdraw in towns like El Calafate and Bariloche and of course, Buenos Aires if you begin your trip there. 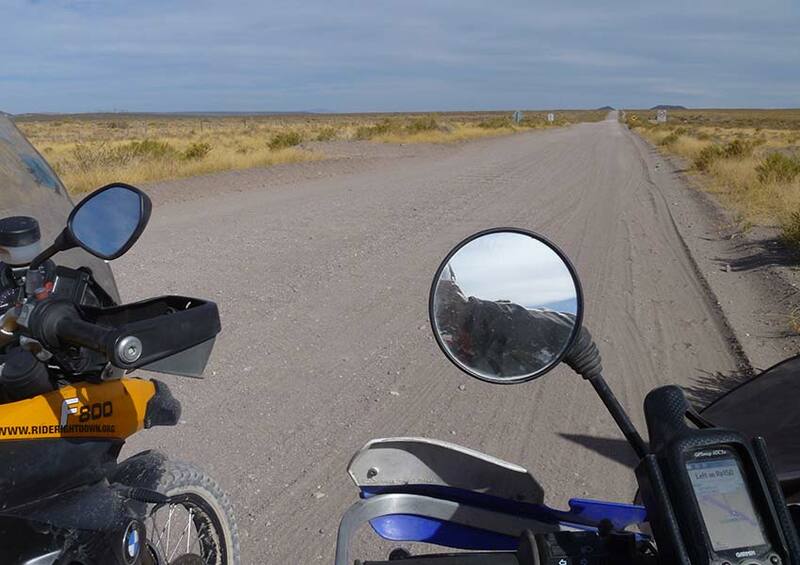 The Ruta 40 goes from subtropical to subpolar via arid plains and year-round cold patches the closer you get to the Andes. September to November is Spring and the best time of year. February in particular brings heavy rains and roads get washed out so travelling at this time is ill advised.